These 3 ft Lap Fence Panels act as a visual boundary for larger gardens. This traditional 3ft lap fence panel is the ideal height for a low level boundary fence. Its horizontal boards feature a smooth edge rather than the usual wavey edge, creating a cleaner looking fence. It has a sturdy framework with three vertical supporting battens to ensure that this panel is strong and robust. Constructed from dip treated timber, this panel comes with a 10 year guarantee against rot. The premium build and durability of our Lap Fence Panel 0.9m make it one of our most popular fence panels. Its strong, straight lines create a traditional and elegant garden boundary. The lower 0.9m height is also perfect for sectioning off parts of your garden, perhaps to grow vegetables or hide away compost. 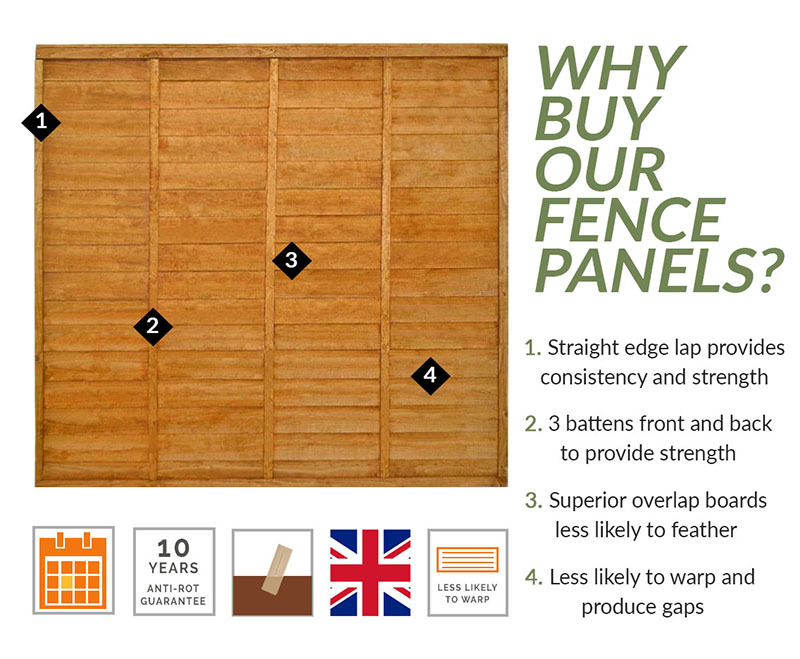 This great value, high quality fence panel is also available in 1.2m, 1.5m and 1.83m.